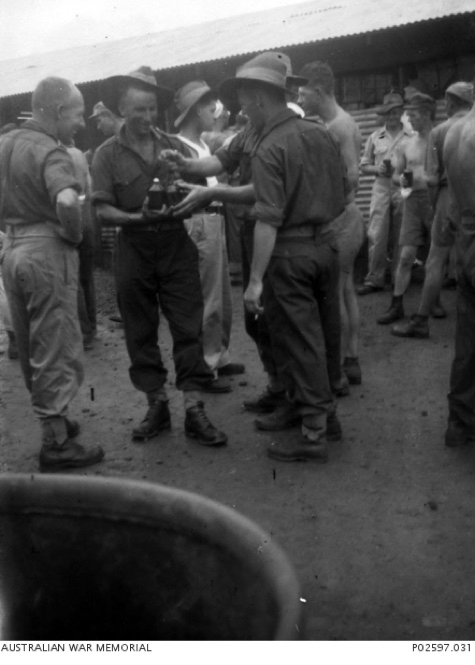 Australian ex-prisoners of war en route from Japan at the 3rd Australian Prisoner of War Reception Group Camp. 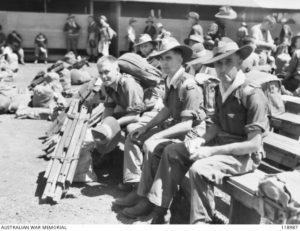 Identified, left to right: WX10104 Sergeant H. Jacobs (Perth WA), 2/4th Machine Gun Battalion; SX8679 Private (Pte) Harold William Nilson (Adelaide SA), 2/3rd Machine Gun Battalion; VX38230 Pte James Arthur Newman, 2/3rd Machine Gun Battalion waiting to embuss at No 8 Camp for embarkation on HMAS Speaker. The above men are believed to be 2/4th at Sydney Wharf. Do you recognise anybody? Please let us know (email: 2nd4thmgb@gmail.com). 2nd from Right: ‘Cowboy’ Matthews. 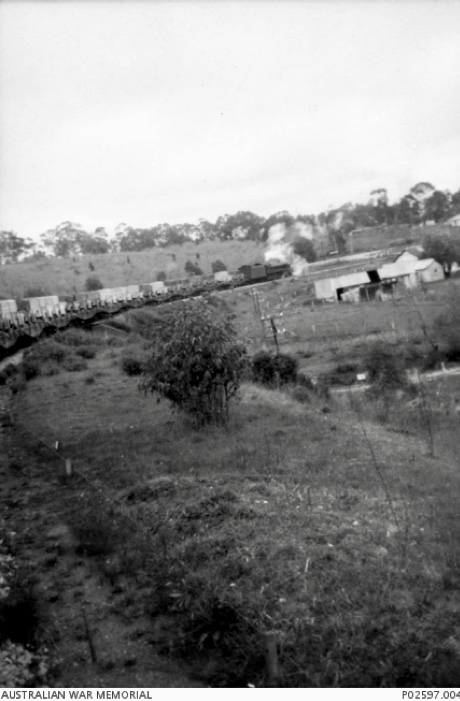 Many POWs from Japan travelled home to Australia by alternative means and routes. 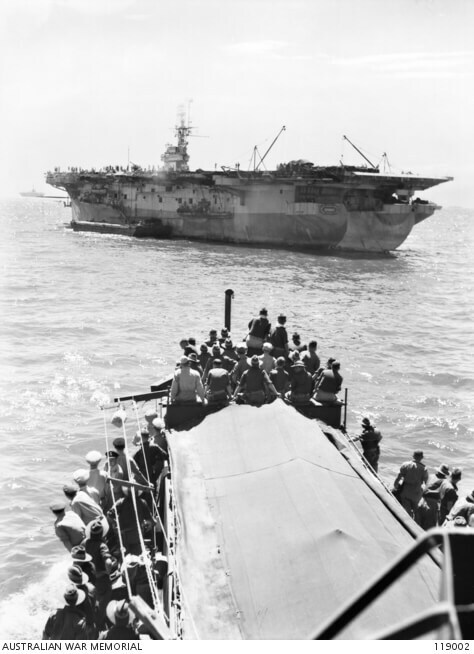 Due to rough weather, the small British aircraft carrier HMS ‘Speaker’ departed Manila on 4th October 1945, a day or so later than scheduled with 556 former POWs from Japan onboard and arrived Sydney 14 October 1965. 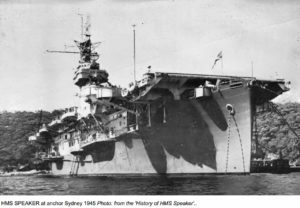 Little-known is that the Australian Waterside Workers Union went on 36 hours strike ensuring HMS ‘Speaker’ anchored outside Sydney Heads waiting to dock. The news was kept quiet from all onboard ‘Speaker’ and for those waiting – authorities were desperate to avoid a huge confrontation between the returning former POWs, ship’s crew, those families waiting and the unionists! 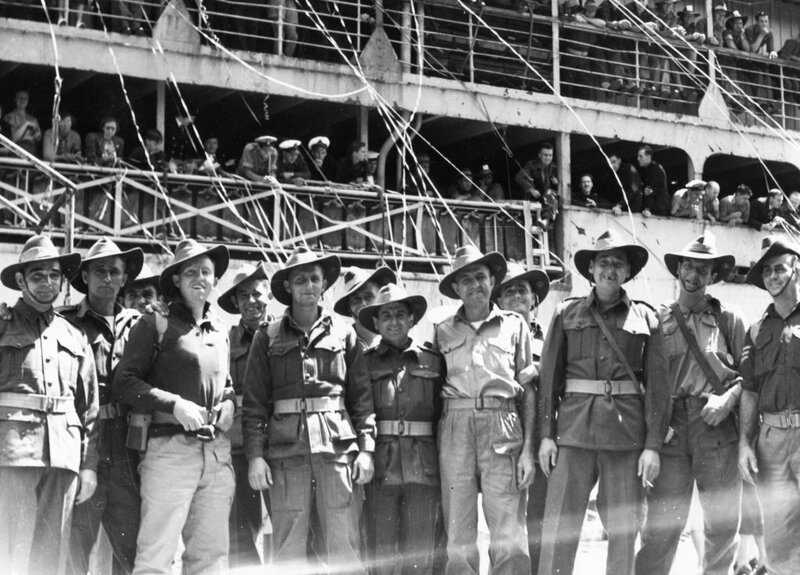 One can well imagine how the former POWs would have dealt with the wharfies – they had not seen Australia and their families for more than three and a half years – most were suffering ill-effects from their ordeal and some were very ill. The former POWs were only too aware they would not have survived another winter in Japan. Their ordeal and brutal incarceration had lasted far too long and many knew they would not have survived another month let alone another Japanese winter. 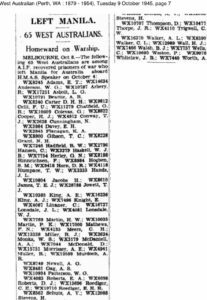 This was not the first time wharf strikes had taken place during Australia’s war. Official records show there were 4123 strikes in Australia, with 3662 in NSW resulting in 5,824,439 working days lost directly through strikes. Greed and corruption was rife. Aside from days lost, there was reported pilfering/theft of food and essential parts going overseas for war equipment, go-slows and sabotage. This extraordinary history frustrated and angered not only the Australian Navy, the British and Americans had threatened to move their main port of supplies elsewhere (including New Zealand). There had been instances of naval crew loading their own goods from wharves. Also instances of confrontation between wharfies and seamen. Many believed this saga proved such additional pressure for Australia’s wartime Prime Minister John Curtin, that it may well have been a factor in his premature death. Interesting is the fact that the former POWs onboard, certainly from 2/4th, (and probably across Australia) remained unaware of this incident. It has been rarely referred to in personal histories. 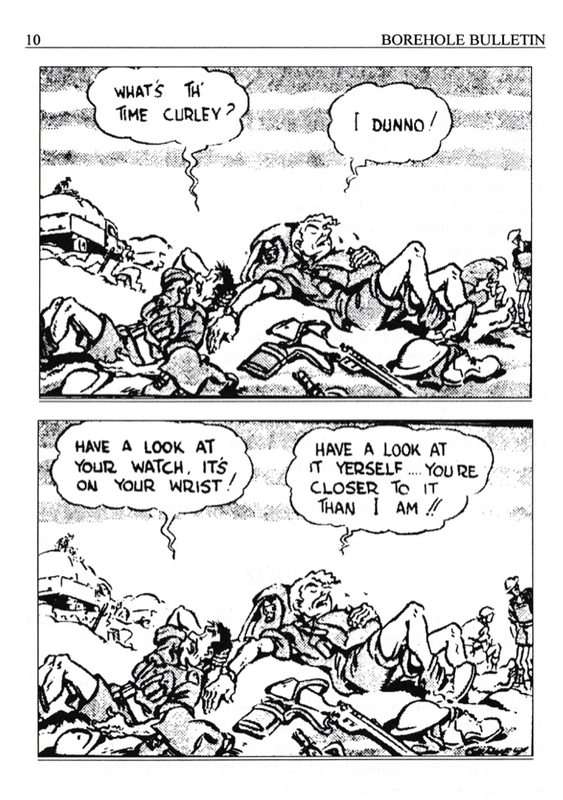 Once back in Australia, the men simply wanted to see family and friends and go home. West Australians who landed in Sydney were desperate to make their way home, seeking the fastest way available. The Government and Unions successfully ‘put away’ this part of Australia’s war-time history. For further detailed reading we suggest ‘Australia’s Secret War: How Unionists Sabotaged Our Troops in World War II’ by Hal Colebatch, published by Quadrant Books. “There were the radio valves pilfered by waterside workers in Townsville which prevented a new radar station at Green Island from operating. So when American dive bombers returning from a raid on a Japanese base were caught in an electrical storm and lost their bearings, there was no radio station to guide them to safety. Lost, they ran out of fuel and crashed, killing all 32 airmen. “The grief was compounded by the fact that had it not been for the greed and corruption on the Australian waterfront such lives would not have been needlessly lost.” Read this review of Colebatch’s book.